Calgary’s River District Community Revitalization Plan identified a need for a community hub that would be accessible to all Calgarians now and in the future. Recognizing that more than half of Calgary’s residents are active library users, the Calgary Public Library, the City of Calgary, and the Calgary Municipal Land Corporation (CMLC) saw an opportunity to build a new library. To ensure this complicated project was successful, CMLC hired us to supplement their existing in-house team with ours, who have the ‘know-how’ to deliver a project of this magnitude. As CMLC’s representative, our team provided comprehensive project management services from concept, through to construction and commissioning, and project close-out. In addition to our core project management services, our team provided a Bid Document Review™ and furniture, fixtures, and equipment management services—both essential to the success of the project. The library opened in November 2018, on time and $10M under budget. A successful manager demonstrates good communications skills, a collaborative approach, and a focus on finding solutions that are technically feasible while accommodating the needs and concerns of all stakeholders. Colliers Project Leaders has demonstrated all these qualities and I have developed a great deal of faith in them and their ability to steer the Central Library towards the intended goal. 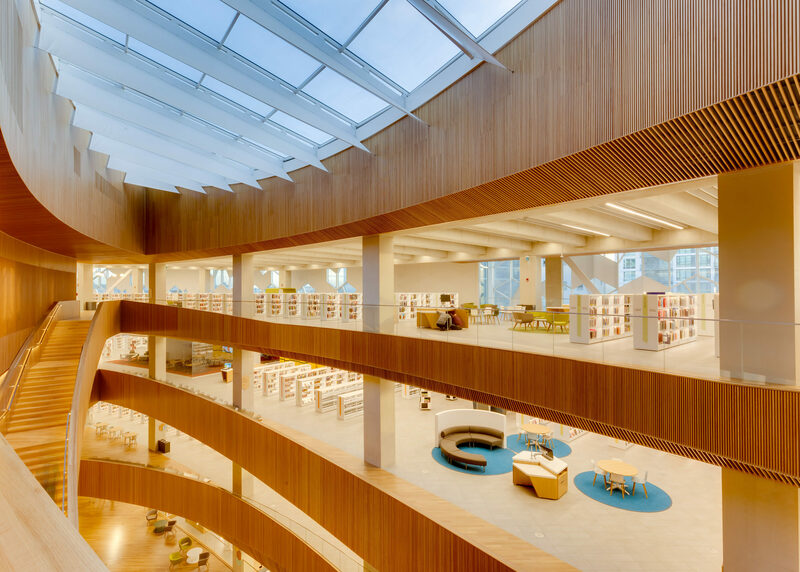 The overall success of the library rested on creating a community space that would connect Calgarians. The major challenge of the library is the site itself, bisected by Calgary’s Light Rail Transit (LRT) in a busy downtown area. A first-of-its-kind project for North America, the library sits overtop of the active LRT line—which had to remain functional for commuters throughout construction. Stakeholder management was a critical component to overcome these challenges. Our leadership team supported CMLC to ensure the project was successfully completed. Due to the complexity of the project, establishing on-time and on-budget expectations was critical to the success of the library. Vigilant management of stakeholder relations and expectations, and meticulous composition of the project plan, ensured we met every challenge with a solution. Through our partnership with CMLC, we successfully delivered the project on schedule and under budget. The library, located in the heart of Calgary, is more than a home for books—it’s a central community hub for residents of all ages. Built with sustainability in mind, the library is working towards LEED Gold certification. The Central Library welcomed 52,223 visitors over its opening weekend in November 2018. Over 20,800 items were checked-out, 3,400 members received a new library card, and 66 tours were held. Designed by award-winning architectural firms, Snøhetta and Dialog, the modern architectural masterpiece was completed on time and $10M under budget. It is no surprise that this innovative civic project has earned multiple news articles and features, including a spot in Architectural Digest’s list of the “12 Most Anticipated Buildings of 2018” and “World’s 9 Most Futuristic Libraries” and a feature in the New York Times “52 Places to Go in 2019”. 240,000-sq.ft. with four floors of collaborative, flexible and interactive spaces and two full service cafes. Calgary Transit Light Rail Transit line actively running under the building. Architecturally exposed concrete and unique wood slat finish throughout interior and exterior. A physical collection of more than 450,000 books. 340-seat theatre and performance hall. 12,000-sq.ft. children’s library featuring soft play areas, activity stations and interactive play house. An area for toddlers and preschoolers featuring a mini-climbing park and a “questionarium”.